It is a very good day. 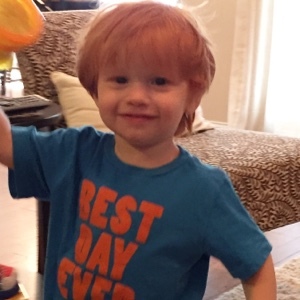 Or as Perry's shirt says, "best day ever." We have all been sick this week. First Perry, then Andrew, then me. It's been just super fun. We were really worried and sad that this virus was going to keep us from Auburn this weekend. But we woke up today feeling pretty good. Still some lingering sore throat but no more fever for anyone and we have our energy back. So we packed our bags and car and are headed for Auburn. We are sad we aren't going to get to stay with GG this trip. We just don't want to take any chances of lingering germs with her. Thankfully we have another trip planned for next month so we will get to see her then. We can't wait to be back on the plains with a full fledged toddler this time. I'm sure there will be lots of stories and pictures to tell afterwards. I am thinking some tailgating and Toomers lemonade are just what we need. War Eagle and Happy Friday!